You hadn’t even entertained the possibility of going bankrupt until it happened, right? Do not worry – you are not alone. Many honest people find themselves neck deep in debt, unable to pay back creditors. It is difficult to re-establish a respectable credit rating post-bankruptcy, but this should not necessarily limit your truck loan options. Although you filed for bankruptcy, you should still be able to receive a loan for a commercial truck at a reasonable rate. Loan rates will be higher for you since you do not have a strong credit rating anymore, but affordable options are still within your reach that will allow you to maintain your business. The lender issuing you a loan is going to check your credit score, so it is important for you to know what they are going to encounter. Do not go into this process with blinders on. If you know your rating then you know what you are working with. It is also a smart idea to review your reports because mistakes are not uncommon. Interesting fact: on-time car loan payments reported during and after bankruptcy can be very helpful for improving your score. The more money you can put down on a truck, the higher the chances you have for getting a loan. The loaner will see that you are serious about your investment. Lenders understand that bankruptcy happens and are usually willing to give you a chance. You should also organize your financial information, such as pay stubs, a copy of your credit report, car payment receipts, etc., as this will help your lender analyze your financials efficiently. It may be tempting to accept the first truck loan offered to you, but be careful whom you partner with. Always shop around. It is important to partner with an honest and sensible lender. Transparency is key – especially after bankruptcy. Our professionals have helped many customers with bankruptcy obtain reasonably priced truck loans. We keep customers informed throughout every stage of the process and have a wide range of loan options to meet customer needs. 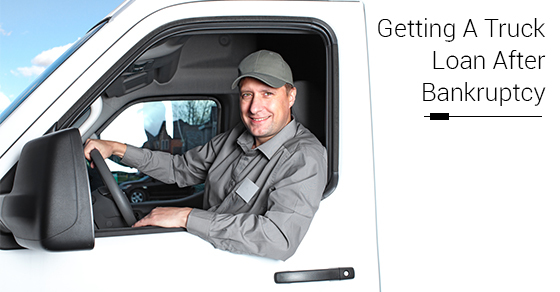 Bankruptcy should not prevent you from getting truck loan credit. Contact us to find out more about the process or to start a loan application today.